I was recently given a piece of material by my father from his garden. 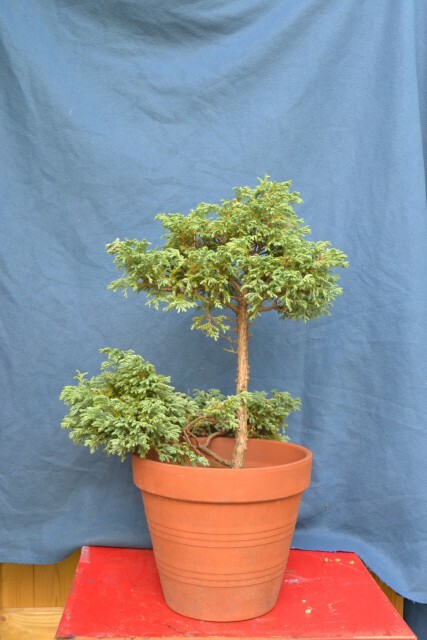 This Sawara Cypress has been growing in the same terracotta flowerpot for many years and has been pretty much unattended. I first really noticed it a few years ago and since then, every time I’m round, it always catches my eye. I didn’t even have to ask my dad for it, he gave up on it years ago really in favour of more attractive deciduous shrubs. As with the Sawara growing in my flowerbed, I gently removed a bit of soil to try and determine nebari but didn’t have much luck. I’ll leave that until the spring when rootpruning and repotting into a shallower growing box. I’ve always seen this tree as promising literati material – a slender trunk with aged bark and gradual taper and a lack of branching in the bottom two thirds of the tree. 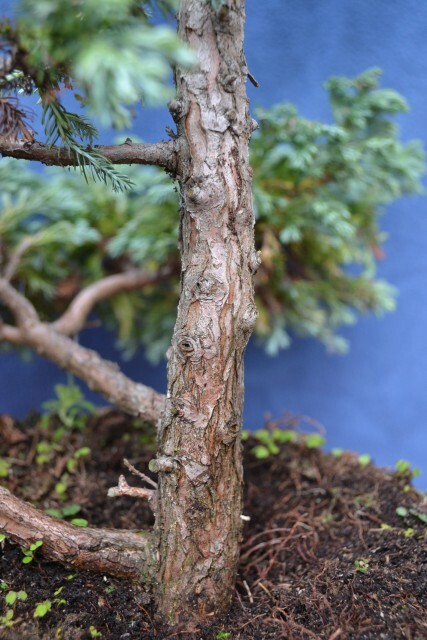 There are two branches that have continued to grow at the base of the trunk but I don’t think they are an option because the bark is very young in comparison to the rest of the tree. I look forward to styling next year (tree health permitting) and putting some bends in the trunk and selecting final branches. All could that could be done now was to slip it out of the terracotta pot and put into a slightly bigger bucket with a layer of grit at the bottom and surrounding the sides in order to help insulate the tightly bound root system this winter. I’ll update it’s progress next year.